Patricia was still a teenager when her single mother died of complications related to AIDS, leaving her to raise her six younger siblings by herself. Sister Florence helped her and her siblings get back on their feet and Patricia has come full circle. Today she serves on the staff of Upendo Village as the Assistant Child Welfare Officer helping those who are in the same position in which she found herself as a teenager. This is her story. I know you have a lot of options for your end of year, tax deductible contributions. Here are two reasons why I hope you will consider making a gift to Upendo Village before the year ends in two days on Thursday: fiscal responsibility and fiscal transparency. Bill Blum is a CPA, former CFO of Wheaton Franciscan Healthcare, and a volunteer member of our Upendo Village Finance Committee. Bill has the education, experience, and expertise to talk knowledgeably about fiscal matters. 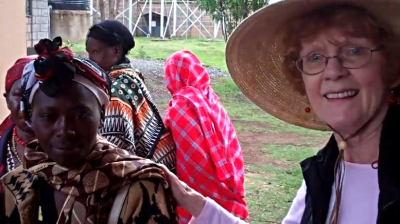 He and his wife, Cheryl (a volunteer member of our Board of Directors), are inspired by the work Sister Florence is doing with those afflicted by HIV/AIDS in Kenya and are strong supporters. Please watch his 2 minute video and share it with your family and friends. Sister Florence's service to our brothers and sisters is accomplished through your generosity. You will never meet Isaac, but he thinks about you and Upendo Village every time he takes a walk around his small plot of land in Naivasha. You provided him with a goat that calved several times. He sold the kids and bought a dairy cow. He uses the milk from the dairy cow to feed his family and then sells the surplus to his neighbors. With that income, he buys stones to build a perimeter wall around his homestead. If Jesus were born today, he would probably be born into the same humble circumstances in which Isaac and his family find themselves. Your support of Upendo Village has empowered them to improve their lives and sustain themselves for the long term. Thank you for sharing your gifts and enabling him to achieve this independence! Watch the video of Isaac and Bridget, the social worker on Sister Florenceâ€™s staff in Upendo Village, and share their story with your friends. Sr. Florence and her dedicated staff helped Daniel and Mary and their eight children get back on their feet by providing a dairy goat, two chickens, and nutritional supplements. 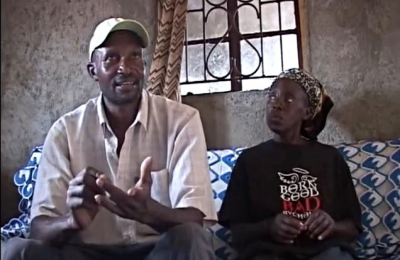 Their son is also a candidate for our Children of Upendo Sponsorship Program (CUSP). None of this could have happened without your support. I was privileged to visit Daniel and Mary in their humble abode. â€œI want to thank you from the United States of America because of the support you are giving to Upendo Village and to us as a positive people (tested postive for AIDS virus). When you go back to your country say Hi to everybody and tell them that the people living with the virus are okay. What we are asking people like you to do is to remember positive people and know that God will bless you in your efforts. Come back again to this home and to Upendo Village.â€ Thank you for your generous support of Upendo Village. Behind the scenes of every great development effort are the great, but humble people who make it happen. We do not hear about them, only the great work they accomplish. One such person is Stefanina. 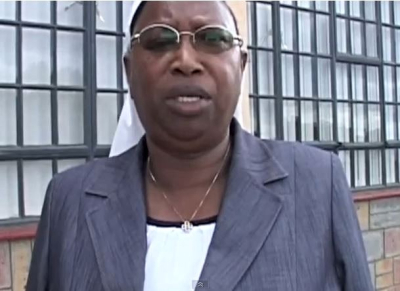 Stefanina is a full-time member of Sr. Florenceâ€™s staff in Kenya. There would be no program for goats without her. In fact, there would be no program of any kind that helps our friends get back on their feet and earn a living to support themselves and their families. She is the Coordinator of the Income Generating Activites (IGA). For the goat program, Stefanina screens the applicants, provides the training on how to raise a goat, distributes the actual goats, and receives the first born to be shared with the newcomers to the program. When you make a general donation to Upendo Village, you help provide a living wage to Stefanina and others like her who are the hearts and hands of our ministry. They make great things happen. But only with your help. Thank you! The Under 5 Mortality Rate (U5MR) is the 33rd worst out of 197 countries. The probability of a child dying before reaching his or her fifth birthday is 71 out of 1,000. In the U.S., it is 6.5 out of 1,000. A child is almost 11 times more likely to die before reaching the age of five in Kenya than in the U.S. These sad statistics set the stage for a happier story. Although the odds are against her, through your generosity, this mother of six has been given a fighting chance. You have given her a dairy goat that will yield two to three quarts of milk a day to help her feed her children and prevent them from becoming part of the statistics above. Thank you! Donors like you helped Alice provide milk to her six children at Upendo Village. Upendo Village is working towards an HIV-Free generation through prevention, education, and treatment. The Prevention of Mother to Child Transmission (PMTCT) project has helped almost 300 babies, born to HIV positive mothers, remain HIV free. 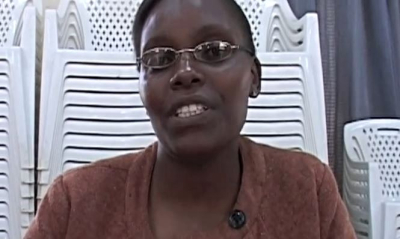 Her, Hellen shares her story. 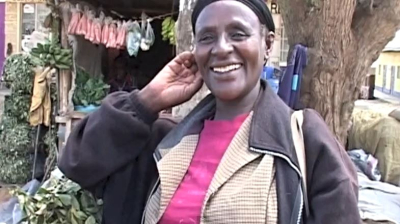 This is the story of Esther, a client of Upendo Village in Naivasha, Kenya. Her social worker, Brigid is telling her story with her. Esther is just one of the over 7,000 people Upendo Village serves every year. Sr. Florence Muia, founder of Upendo Village talks about the impact our donors have been able to make in Kenya. 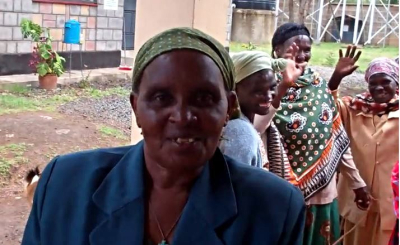 Upendo Village's Grandma-to-Grandma program provides resources to women like Ruth, and this is her story. Two of Ruth's daughters died from AIDS and left her with 9 grandchildren to raise at the age 84 and with her own health issues. In 2006, Upendo Village learned that one of the grandchildren is HIV positive and needs special care. Upendo Village began providing resources to help the family. They were provided medical care, food supplementation, counseling and social support, a modest home upgrade and dairy goat.